I heard once that fast food joints view the smell of their cooking grease as a marketing tool—that if you could smell the French fries and beef burgers cooking, it might draw you in. No doubt some fast food marketing department somewhere has conceived a special kind of “stink pump” to push that smell farther into the neighborhoods in the interest of driving sales. No doubt that person got a raise. Whether that’s true or not, I can’t cozy up to the idea that the constant stink of fast food is a good thing for a neighborhood. Neither do I think the addition of litter and noise is a plus. And when fast food joints locate in dense residential neighborhoods with traffic lights, turning cars, drive ways, kids on bikes, and people walking, I think there are safety concerns, too. All that applies to McDonalds’ Detroit Avenue proposal, and any other fast food, drive thru possibility that should surface for Detroit or Madison Avenues. Lakewood is not a highway exit. According to McDonalds own statements, nearly 70 percent of the company’s business is done through the drive-thru window. Imagine the numbers of people who leave the fast food parking lot with fries in their lap, a drink in the cup holder and a burger—with a curl of onion dripping ketchup—sliding out the back. As that person drives down Detroit, he has to use the brake. Clutch. Shift. Change lanes. Put the sandwich down. Watch out for the RTA bus. Sip. 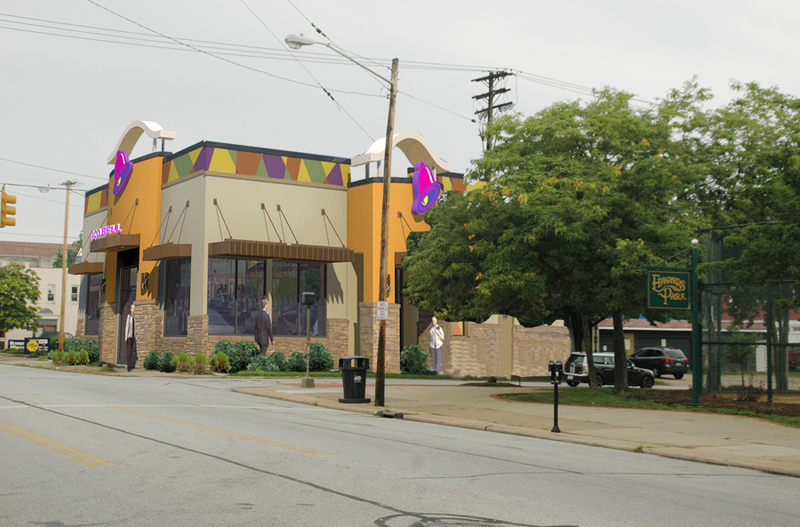 In the wake of the McDonalds proposal– and amid rumors that Taco Bell might be interested in moving West–Lakewood Ward 1 councilman David Anderson has asked the city planning commission to look into setting some conditions for the operation of drive thru windows as part of a business model on the city’s commercial streets. If you want to have your say on the issue, come to the meeting tonight—Thursday, August 4, 2011, at 7 p.m. at City Hall. If you care about how the city feels, and whether Detroit and Madison retain their character or lose it to big fast food and drugstore chains, this is a big deal.